February is National Sweet Potato month. I’ve only recently started adding sweet potatoes to our meal rotation after discovering how versatile they are and how many delicious recipes there are using sweet potatoes! Also, sweet potatoes are very good for you! They are packed full of fibre, protein, vitamin A, beta carotene and potatssium. 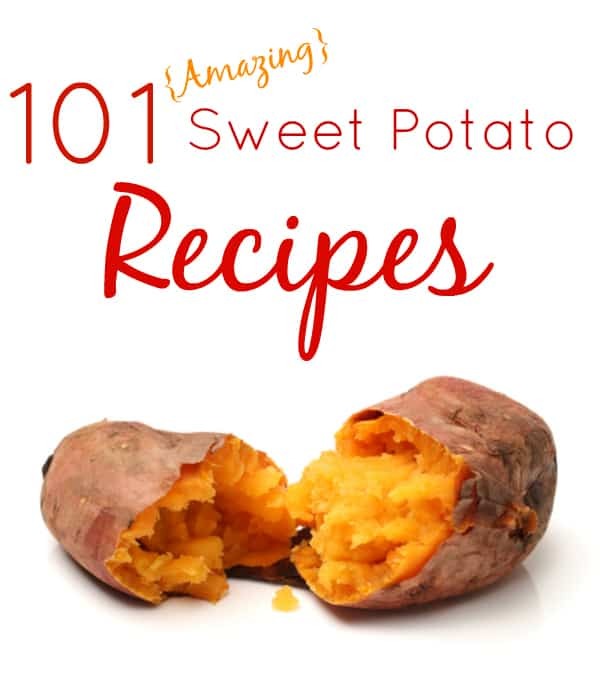 As you can see from my list of 101 amazing sweet potato recipes, there’s a multitude of ways you can include sweet potatoes in your diet. Which recipe are you interested in trying first? I pinned the post to try some of these recipes. I want to try the Goat Cheese And Sweet Potato Mini Quiche recipe first I think. I had no clue there were so many recipes for sweet potatoes, hanks for sharing. I loveeee sweet potatoes. Definitely pinning this for later. Thanks for all of the great ideas!! Thanks for the feature! Great assortment of recipes too! I love sweet potatoes but have so few recipes that I like for them. I will have to give these the once over to check out any new ideas. I dislike sweet potatos but hubby loves them,thanks for the awesome assortment of recipes .I will be sure to find a few he will enjoy. Awesome recipes. I love sweet potatoes so much!